India has one of the highest incidences of oral cancer in the world. Oral cancer ranks number one among men and number three among women in India. Oral cancer constitutes 12% of all cancers in men and 8% of all cancers among women. In India, the age-standardized incidence rate of oral cancer is 10.1 for men. The most common subsite involved in oral cavity cancer (OCC) in Indian communities in Africa and Southeast Asia is gingivobuccal cancer (GBC) (about 40% of all); while in Western world its rate is around 10%. GBC has been aptly described as the “Indian Oral Cancer”. GBC are unique and predominantly common OCC in the Indian subcontinent. Two- and five-year overall survival is about 63% and 53%, respectively, in apex institutes. Tobacco and areca nut are the most common cause of GBC, and the immigrants from South Asian countries to Western world show typically more incidence. These substances are being used with different names and preparations such as gutkha, mava, chinkani (snuff), khaini. They cause site specific SCC where they are placed, typically bucco alveolar (BA) sulcus or gingivolabial sulcus. Increasing alcohol and tobacco consumption significantly elevates the risk of the development of SCC. Certain dietary deficiencies such as iron, Vitamin A, C, and E are associated with oral cancers. Majority of GBC are SCC. Other includes minor salivary gland cancers, lymphoma, Kaposi's sarcoma, and mucosal melanoma. Leukoplakia is clinically a white patch, but pathologically, the changes are of hyper or parakeratosis and acanthosis, with or without cellular atypia or dysplasia. There is about 0%–20% chance of progression to invasive cancer depending on type of leukoplakia. It is a red patch with or without granular appearance and has increased risk of malignant transformation (8%–20%). It needs more aggressive interventions compared to leukoplakia. It is a premalignant condition characterized by submucosal fibrosis in oral cavity due to excessive deposition of fibroblasts and collagen fibers induced by carcinogens such as arecoline, tobacco, etc. OSF presents in various stages from whitish discoloration to papules with erosive ulcers. The carcinogens inhibit the phagocytosis of fibroblasts and collagen which leads to their abnormal deposition. SCC of gingivobuccal area has different morphologic subtypes and associated biological behavior [Figure 2]. A verrucous carcinoma is an exophytic growth with warty appearance and submucosal invasion with broad pushing well-defined tumor cells. Biologically, this is usually a locally destructive cancer without metastatic potentials especially in its pure form. Many a time, excision of the entire lesion finds out areas of dedifferentiation and invasive garden variety of SCC. A papillary SCC is uncommon variant characterized by papillary proliferations and is also noninvasive and nonmetastatic in its pure form. Conventional invasive SCC has typically keratinized or non-keratinized cells with nuclear pleomorphism with or without vascular, lymphatic, and perineural invasion. 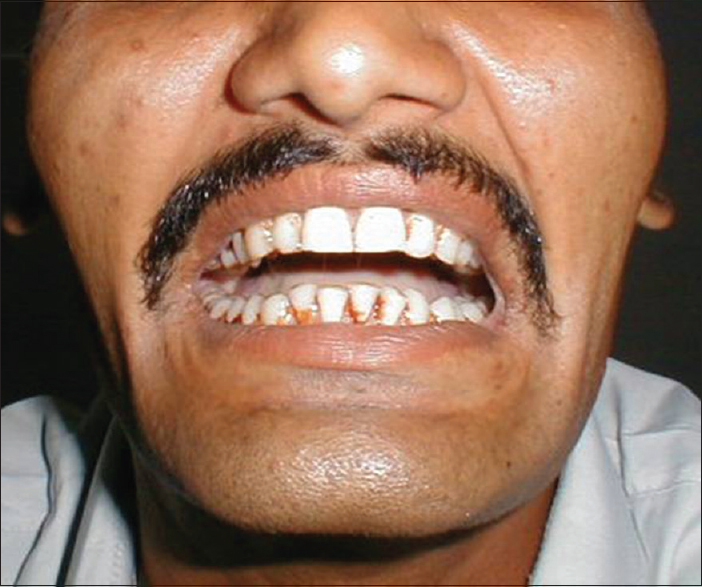 This is the most common variety of SCC detected in gingivobuccal area. Sarcomatoid SCC is a rare variant having sarcoma-like spindle cell features. These are typically invasive with aggressive course showing resistance to conventional radiotherapy and chemotherapy. Basaloid SCC has poor cellular differentiation, necrosis, hyaline material and keratin pearl formation. Clinically, this is very aggressive carcinoma compared to other forms. Complete history with an assessment of risk factors is extremely important as etiologies such as tobacco and areca nut chewing can predispose the patient for field cancerization and possibilities of detecting multicentric disease. The primary GBC tumor is usually ulcerative and infiltrative rather than exophytic. Careful assessment of SMF is important as in the absence of SMF; trismus suggests deeply infiltrative disease. The symptom of temporal headache and facial pain on the affected side needs a radiological evaluation for perineural spread to the skull base. Extension of the primary lesion to other subsites mobility of the lesion over mandible and skin involvement are important findings for management. Clinical evidence of paramandibular spread or retromolar trigone involvement is best evaluated by palpation, especially by bimanual method between fingers in oral mucosa and on skin. Distant metastasis is quite rare ranging from 8% to 17%, and the most common site is the lung, liver and bone in that order. Apart from investigations to define comorbidities and chronic medical conditions, most of the imaging and laboratory tests are defined to stage the disease and consequently help selection of treatment as well as prognostication. Investigations are also useful for posttreatment evaluations. Soft-tissue extent of disease is critical in upper GBC for infratemporal fossa (ITF) involvement and to assess perineural skull base extension. 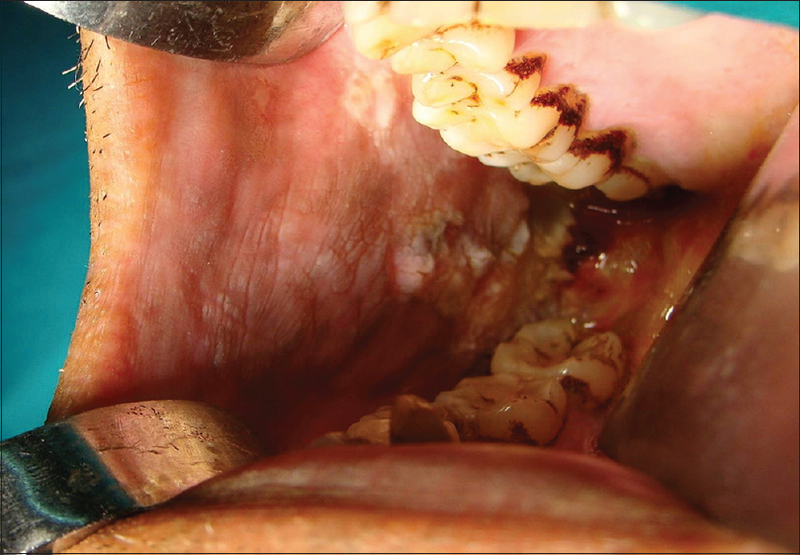 Lower GBC needs to be evaluated for para mandibular spread and perineural spread in extensive lesions. Multidetector contrast-enhanced computed tomography (CT) scan from skull base to clavicle in all three planes is a common choice of investigation and contrast-enhanced MRI can better detect marrow involvement as well as perineural involvement. Gross involvement of mandible can be seen on orthopantomogram; however, minimal cortical involvement is best imaged on bone window CT scan. Hybrid methods (positron emission tomography [PET]/CT, PET/magnetic resonance imaging, and single photon emission computed tomography/CT) have their role in some special situations for locally advanced primary, recurrent or salvage situations. A simple, repeatable, cost-effective, noninvasive tool such as ultrasonography (USG) can provide extremely important information. USG findings are more correlated with the pathologic findings than palpation; however, CT gives the most effective and reliable results when it is combined with USG in neck staging. 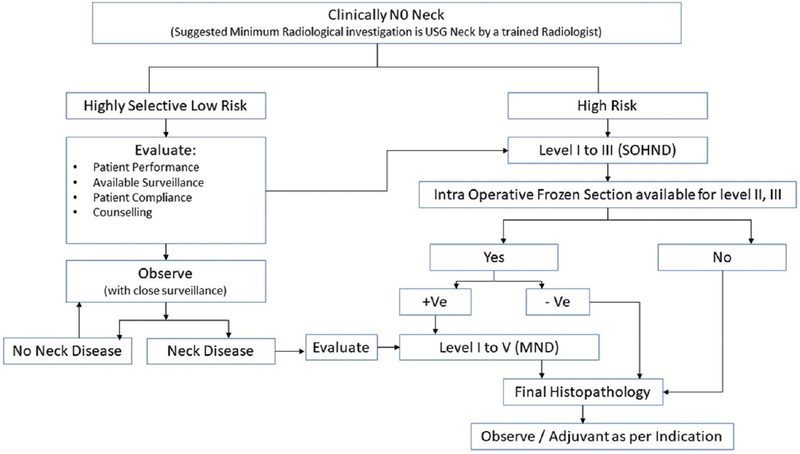 Preoperative USG and CT scanning of the neck by an experienced radiologist are essential and useful for diagnosis, staging, and therapy choices. USG-guided FNAC can be a useful tool in doubtful or post-treatment situations. Accurate staging provides the basis of appropriate selection of therapy and subsequent reporting of end results. Tumor node metastasis staging proposed by the American Joint Comity on Cancer and the International Union against Cancer is the widely used staging system all worldwide. The paramount objective of curing the patient is well understood. However, preservation of form and function, and when not possible restoration of same; obtaining good quality of life has become the equally important aim of treatment. Reducing the sequelae of the treatment and prevention of second primary cancer also needs consideration. The risk of death from a second primary cancer in patients with early-stage cancer of the head and neck is higher than the risk of dying of the original primary. Age and general medical conditions are important for tolerating optimal treatment plan. Patient's occupation, tolerance, acceptance, and compliance do influence the choice of initial treatment. Socioeconomic considerations as well as availability of therapeutic facilities also play a major role. A successful management team not only includes head-and-neck surgical oncologist, radiation oncologist, and medical oncologist but also plastic and reconstructive surgeon, dentist, rehabilitation expert, physiotherapist, nutritionist, and oncopsychologist, etc. Early lesions (T1–T2) can be effectively treated with either surgery or radiation as single modality. Surgery is choice of treatment when SMF is associated. Surgery is also preferred for the lesions located in lower GB sulcus (may or may not be involving mandible) as radiation causes osteoradionecrosis (ORN) in these situations. Advanced lesions require multimodality treatment with surgery as initial part of management when the disease is operable. The concept of “commando operation” warranting the need for an in-continuity “composite resection” of uninvolved mandible is obsolete as no lymphatic channels pass through the mandible. Sacrificing the normal uninvolved mandible to gain access to the primary tumor or to accomplish an in-continuity composite resection is no longer justified. Segmental or hemimandibulectomy is indicated only when (1) mandible is grossly involved by cancer, (2) invasion of soft tissue of inferior alveolar canal by tumor, and (3) Massive soft-tissue disease adjacent to mandible – para mandibular spread. There is literature evidence that point of mandibular entry of tumor is at abutment, which in both the dentate and edentulous jaw is often at the junction of the reflected and attached mucosa. However, this might be more so for the floor mouth and alveolar cancers compared to BA sulcus cancers. Of all GBC, the cancers of retromolar trigone are extremely aggressive and mandible and pterygoid region invasion occur early. Inferior dental and lingual nerve involvement are also frequent. L-shaped marginal mandibulectomy can be only done in carefully selected early cases. Most of these patients require segmental or hemimandibulectomy with ITF clearance. The most important prognostic factor for head-and-neck SCC is presence of cervical lymph node metastasis. Size of metastatic lymph nodes, number of nodes, level of involvement, extranodal spread, and tumor emboli in the intervening lymphatics also influence prognosis. The pattern of lymph node metastasis from GBC is well established. The management of clinically N0 neck has been addresses by many. A recent single institute randomized controlled trial advocates elective neck dissection. In a clinically well-investigated N0 neck with T1-2 primary, an educated, motivated patient can be offered close observation of neck with therapeutic intervention at a further date if required as the chances of occult neck node metastasis is <20% in this scenario.,, Frozen section of lymph nodes at level II, III, and IV can be useful in T3 and T4 primaries [Figure 8] and [Figure 9]. On the other hand, for clinically positive neck, full neck dissection removing Level I to Level V is mandatory. However, in clinically doubtful cases, frozen section of supra omohyoid neck dissection specimen can help to decide further neck management. Preservation of accessory nerve, sternomastoid muscle and internal jugular vein depends on intraoperative findings, level of lymph node metastasis, and presence of extracapsular spread (modified neck dissection). In spite of its significant functional and esthetic morbidity, radical neck dissection still remains the treatment of choice in patients presenting with N2b or N3 disease and/or recurrent disease. All efforts should be made to preserve the accessory nerve if it is not involved clinically in this situation. Control of regional disease in neck is not compromised by preservation of the accessory nerve and almost all these patients require adjuvant radiation because of their gross nodal status. Bilateral neck dissection is required for clinically involved neck and in case of certain predictive factors such as tumor and location. Small defects can be managed with STG, vascularized buccal fat pad transposition, local mucosal advancement, nasolabial flap, palatal flap and tongue flap. Medium and large-sized defects with preserved mandible can be reconstructed best with free flaps like free radial artery forearm flap and anterolateral thigh flaps etc. [Figure 10]. In carefully selected patients, pectoralis major myocutaneous flap (PMMCF) can also be placed esp. when microvascular techniques are not available or as salvage of free flap failure. Although the PMMF was the method of choice for many years, advances in microsurgery techniques have constrained their gradual introduction, so the indications for the pectoralis flap have undergone a regression at the expense of an increase in the indications for free flaps. In complex defects where segmental or larger mandibular defect is produced, reconstruction is challenging as it not only involves the esthetics but also important functional aspects. Free flaps such as fibula osteomyocutaneous flap, deep circumflex iliac artery-based iliac crest flap, Scapular osteomyocutaneous flap, etc., are the state-of-the-art reconstruction modalities giving optimal functional and esthetic results. Free fibula osteomyocutaneous flap is widely used, gold standard replacement, and subsequent implant placement is better because of the tough cortex. Tissue engineering-based reconstruction may hold great future in reconstruction of GBCs [Figure 11]. Radiotherapy as primary modality is rarely used as surgery is expeditious, provides pathology for examination; allowing identification of prognostic factors. Side effects such as xerostomia, mucositis, dysphagia and more so for GBC-ORN are the reasons for general selection of surgery as first line of treatment. Early OCCs are highly curable and patients are at high risk of developing second cancers which might be less amenable to function preserving surgeries, and hence, radiation can be kept reserved for such eventualities. Therefore, primary radiotherapy is reserved only for patients with significant comorbidities or with special desires and for large inoperable primary or recurrent tumors. Adjuvant radiation therapy is employed for improvement in locoregional disease control in postoperative settings. Advance pathological Stage (III and IV), positive margins, perineural invasion, tumor spillage, multiple positive nodes, and extracapsular spread are standard indications for adjuvant radiotherapy. Relative factors to be looked at in the context of the overall clinical picture are depth of invasion more than 5 mm, close margins, irregular pattern of invasion with infiltrative margins, and poor differentiation. Standard adjuvant radiotherapy is external beam radiation of 60 Gray given once daily in fractions of 2 Gy, comprising of 30/33 fractions. Side effects such as xerostomia, mucositis, dysgeusia, and ORN also occur in adjuvant radiotherapy settings. ORN is most significant complication and the risk factors are health of dentition, volume of mandible within the field of radiation and dosage, as well as blood supply of residual mandible. Prevention with prophylactic dental care before starting radiation is mandatory. Recently, this approach is being studied more showing high response rates even in previously treated patients. This modality is logistically demanding and real benefit over conventional intravenous chemotherapy still needs to be proven. Rehabilitation should start from initial consultation taking care of functional aspects of oral cavity, dental and prosthetic issues, and psychosocial aspects. A very interactive coordination between the team players including surgeon, radiation and medical oncologist as well as medical staff, psycho-oncologist, dietician, speech therapist, dentist, prosthodontist, social workers, along with the patient, family are caretakers is essential for a complete satisfactory rehabilitative outcome. Pedicle flaps do worse than free flaps. Misra S, Chaturvedi A, Misra NC. 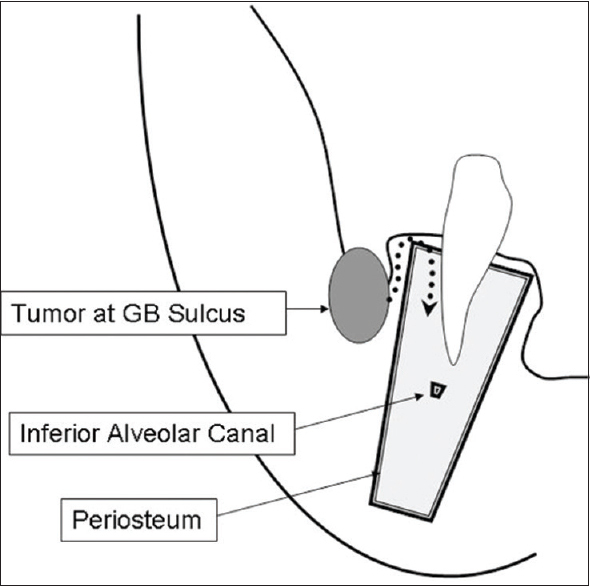 Management of gingivobuccal complex cancer. Ann R Coll Surg Engl 2008;90:546-53. Christopher JO, Brien TJ. Epidemiology in head and neck cancer. In: Souza CD, editor. Head and Neck Surgery. 1st ed. Delhi, India: Jaypee Brothers Medical Publishers (P) Ltd.; 2009. p. 939-69.
WHO. Globocan. Globocan; 2012. Available from: http://www.globocan.iarc.fr/Default.aspx. [Last accessed on 2018 May 25]. Auluck A, Hislop G, Poh C, Zhang L, Rosin MP. Areca nut and betel quid chewing among South Asian immigrants to western countries and its implications for oral cancer screening. Rural Remote Health 2009;9:1118. Rothman K, Keller A. The effect of joint exposure to alcohol and tobacco on risk of cancer of the mouth and pharynx. J Chronic Dis 1972;25:711-6. Singhvi HR, Malik A, Chaturvedi P. The role of chronic mucosal trauma in oral cancer: A Review of literature. Indian J Med Paediatr Oncol 2017;38:44-50. Leemans CR, Snijders PJF, Brakenhoff RH. The molecular landscape of head and neck cancer. Nat Rev Cancer 2018;18:269-82. 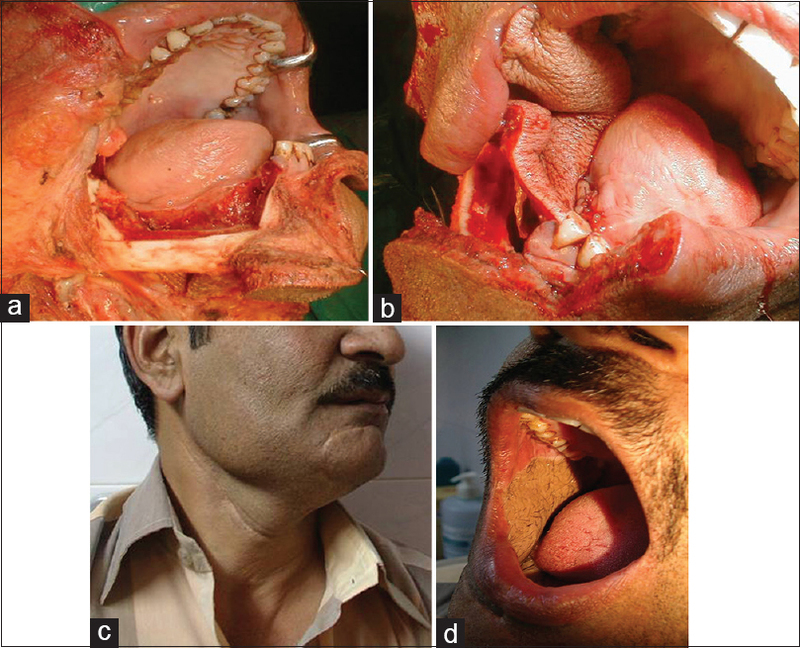 Wollina U, Verma SB, Ali FM, Patil K. Oral submucous fibrosis: An update. Clin Cosmet Investig Dermatol 2015;8:193-204. Lodi G, Sardella A, Bez C, Demarosi F, Carrassi A. Interventions for treating oral leukoplakia. In: Lodi G, editor. Cochrane Database of Systematic Reviews. Chichester, UK: John Wiley and Sons, Ltd.; 2004. p. CD001829. Medina JE, Dichtel W, Luna MA. Verrucous-squamous carcinomas of the oral cavity. A clinicopathologic study of 104 cases. Arch Otolaryngol 1984;110:437-40. Ishiyama A, Eversole LR, Ross DA, Raz Y, Kerner MM, Fu YS, et al. Papillary squamous neoplasms of the head and neck. Laryngoscope 1994;104:1446-52. Poleksic S, Kalwaic HJ. Prognostic value of vascular invasion in squamous cell carcinoma of the head and neck. Plast Reconstr Surg 1978;61:234-40. Batsakis JG, Rice DH, Howard DR. The pathology of head and neck tumors: Spindle cell lesions (sarcomatoid carcinomas, nodular fasciitis, and fibrosarcoma) of the aerodigestive tracts, part 14. Head Neck Surg 1982;4:499-513. Raslan WF, Barnes L, Krause JR, Contis L, Killeen R, Kapadia SB, et al. Basaloid squamous cell carcinoma of the head and neck: A clinicopathologic and flow cytometric study of 10 new cases with review of the English literature. Am J Otolaryngol 1994;15:204-11. Shah JP, Lydiatt W. Treatment of cancer of the head and neck. CA Cancer J Clin 1995;45:352-68. Betka J. Distant metastases from lip and oral cavity cancer. ORL J Otorhinolaryngol Relat Spec 2001;63:217-21. Carreras-Torras C, Gay-Escoda C. Techniques for early diagnosis of oral squamous cell carcinoma: Systematic review. Med Oral Patol Oral Cir Bucal 2015;20:e305-15. Baker HW. Biopsy: Definitive diagnosis of oral cancer. CA Cancer J Clin 1972;22:159-62. Arya S, Chaukar D, Pai P. Imaging in oral cancers. Indian J Radiol Imaging 2012;22:195-208. Pałasz P, Adamski Ł, Górska-Chrząstek M, Starzyńska A, Studniarek M. Contemporary diagnostic imaging of oral squamous cell carcinoma – A review of literature. Pol J Radiol 2017;82:193-202. Haberal I, Celik H, Göçmen H, Akmansu H, Yörük M, Ozeri C. Which is important in the evaluation of metastatic lymph nodes in head and neck cancer: Palpation, ultrasonography, or computed tomography? Otolaryngol Head Neck Surg 2004;130:197-201. Emonts P, Bourgeois P, Lemort M, Flamen P. Functional imaging of head and neck cancers. Curr Opin Oncol 2009;21:212-7. Amin MB, Edge SB, Greene FL, Byrd DR, Brookland RK, Washington MK, et al., editors. In: AJCC Cancer Staging Manual. 8th ed. Switzerland: Springer; 2018. Lippman SM, Hong WK. Second malignant tumors in head and neck squamous cell carcinoma: The overshadowing threat for patients with early-stage disease. Int J Radiat Oncol Biol Phys 1989;17:691-4. More Y, Sharma S, Chaturvedi P, D'Cruz AK. 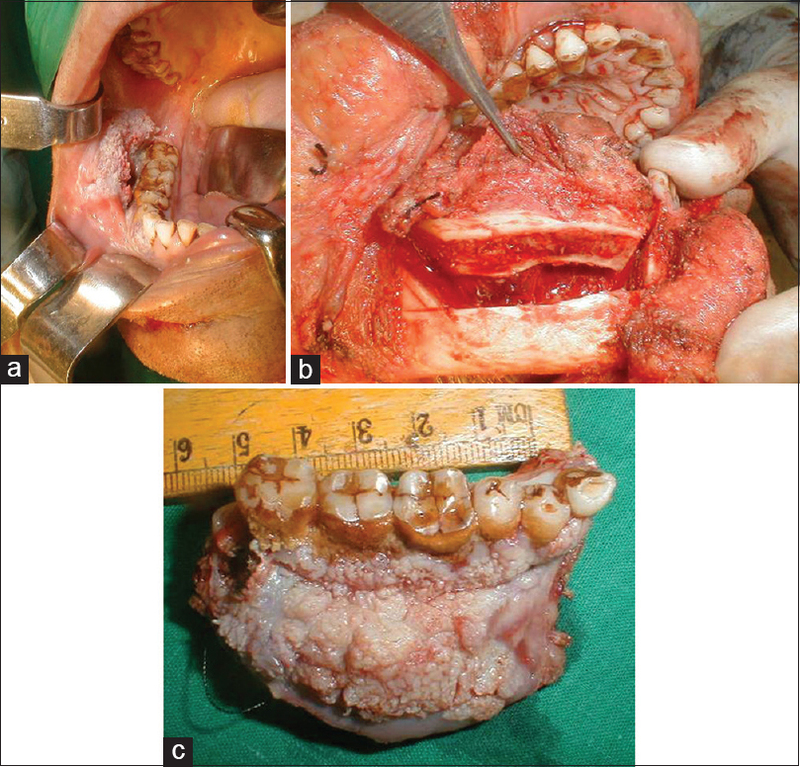 Gingivobuccal mucosal cancers: Resection to reconstruction. Curr Opin Otolaryngol Head Neck Surg 2014;22:95-100. Iyer SG, Pradhan SA, Pai PS, Patil S. Surgical treatment outcomes of localized squamous carcinoma of buccal mucosa. Head Neck 2004;26:897-902. Trivedi NP, Kekatpure V, Kuriakose MA. Radical (compartment) resection for advanced buccal cancer involving masticator space (T4b): Our experience in thirty patients. Clin Otolaryngol 2012;37:477-83. Liao CT, Chang JT, Wang HM, Ng SH, Hsueh C, Lee LY, et al. Surgical outcome of T4a and resected T4b oral cavity cancer. Cancer 2006;107:337-44. Patil VM, Noronha V, Joshi A, Muddu VK, Gulia S, Bhosale B, et al. Induction chemotherapy in technically unresectable locally advanced oral cavity cancers: Does it make a difference? Indian J Cancer 2013;50:1-8. Hakeem AH, Pradhan SA, Tubachi J, Kannan R. Outcome of per oral wide excision of T1-2 N0 localized squamous cell cancer of the buccal mucosa – Analysis of 156 cases. Laryngoscope 2013;123:177-80. Shah JP, Gil Z. Current concepts in management of oral cancer – Surgery. Oral Oncol 2009;45:394-401. Jatin S, Patel Snehal SB. Jatin Shah's Head and Neck Surgery and Oncology. 4th ed. Philadelphia: Mosby; 2012. McGregor IA, MacDonald DG. 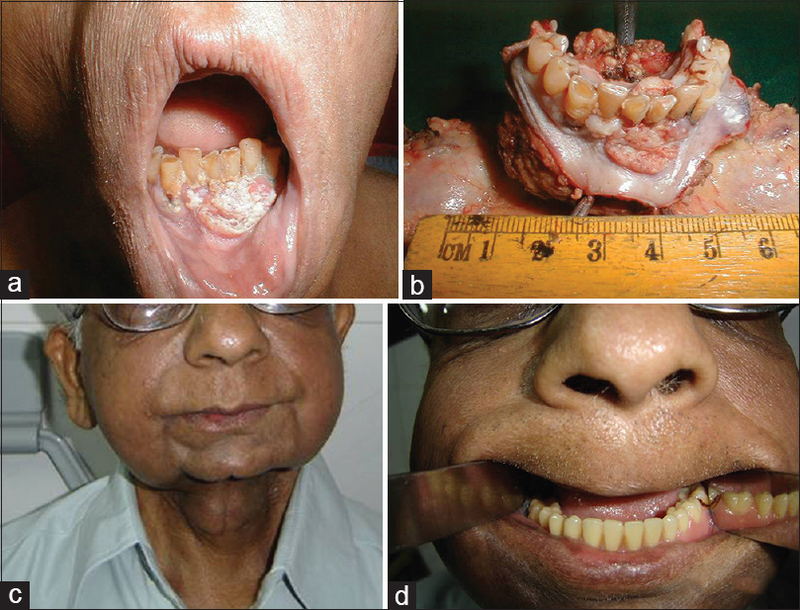 Spread of squamous cell carcinoma to the nonirradiated edentulous mandible – A preliminary report. Head Neck Surg 1987;9:157-61. Hao SP, Tsang NM, Chang KP, Chen CK, Huang SS. Treatment of squamous cell carcinoma of the retromolar trigone. Laryngoscope 2006;116:916-20. Spiro RH, Alfonso AE, Farr HW, Strong EW. Cervical node metastasis from epidermoid carcinoma of the oral cavity and oropharynx. A critical assessment of current staging. Am J Surg 1974;128:562-7. Mair MD, Shetty R, Nair D, Mathur Y, Nair S, Deshmukh A, et al. Depth of invasion, size and number of metastatic nodes predicts extracapsular spread in early oral cancers with occult metastases. Oral Oncol 2018;81:95-9. Rao VU, Patil PH, Rajaram BV. Management of the neck in early oral cancers: Is the verdict out? J Cancer Res Ther 2016;12:1114-6. Mizrachi A, Migliacci JC, Montero PH, McBride S, Shah JP, Patel SG, et al. Neck recurrence in clinically node-negative oral cancer: 27-year experience at a single institution. Oral Oncol 2018;78:94-101. Deo SV, Shukla NK, Jha D, Khanna P, Pandit A, Thulkar S, et al. Are we over-treating neck in buccal &amp; alveolo-buccal cancers: Experience from a tertiary cancer care center. Indian J Surg Oncol 2012;3:272-5. Lim YC, Song MH, Kim SC, Kim KM, Choi EC. Preserving level IIb lymph nodes in elective supraomohyoid neck dissection for oral cavity squamous cell carcinoma. Arch Otolaryngol Head Neck Surg 2004;130:1088-91. Agarwal SK, Akali NR, Sarin D. Prospective analysis of 231 elective neck dissections in oral squamous cell carcinoma with node negative neck-to decide the extent of neck dissection. Auris Nasus Larynx 2018;45:156-61. Andersen PE, Shah JP, Cambronero E, Spiro RH. The role of comprehensive neck dissection with preservation of the spinal accessory nerve in the clinically positive neck. Am J Surg 1994;168:499-502. Villanueva-Alcojol L. Contralateral neck dissection in oral squamous cell carcinoma: When it shoud be done? Plast Aesthet Res 2016;3:181. Garrel R, Poissonnet G, Temam S, Dolivet G, Fakhry N, de Raucourt D, et al. Review of sentinel node procedure in cN0 head and neck squamous cell carcinomas. Guidelines from the french evaluation cooperative subgroup of GETTEC. Eur Ann Otorhinolaryngol Head Neck Dis 2017;134:89-93. Schilling C, Stoeckli SJ, Haerle SK, Broglie MA, Huber GF, Sorensen JA, et al. Sentinel european node trial (SENT): 3-year results of sentinel node biopsy in oral cancer. Eur J Cancer 2015;51:2777-84. Kuriakose M, Sharma M, Iyer S. Recent advances and controversies in head and neck reconstructive surgery. Indian J Plast Surg 2007;40:3-12. Available from: http://www.ijps.org/article.asp?issn=0970-0358;year=2007;volume=40;issue=12;spage=3;epage=12;aulast=Kuriakose. [Last accessed on 2018 Apr 20]. Chim H, Salgado CJ, Seselgyte R, Wei FC, Mardini S. Principles of head and neck reconstruction: An algorithm to guide flap selection. Semin Plast Surg 2010;24:148-54. Al Afif A, Uys HK, Taylor SM. Improving aesthetic outcomes after head and neck reconstruction. Curr Opin Otolaryngol Head Neck Surg 2018:1. doi:10.1097/MOO.0000000000000462. Liu HL, Chan JY, Wei WI. 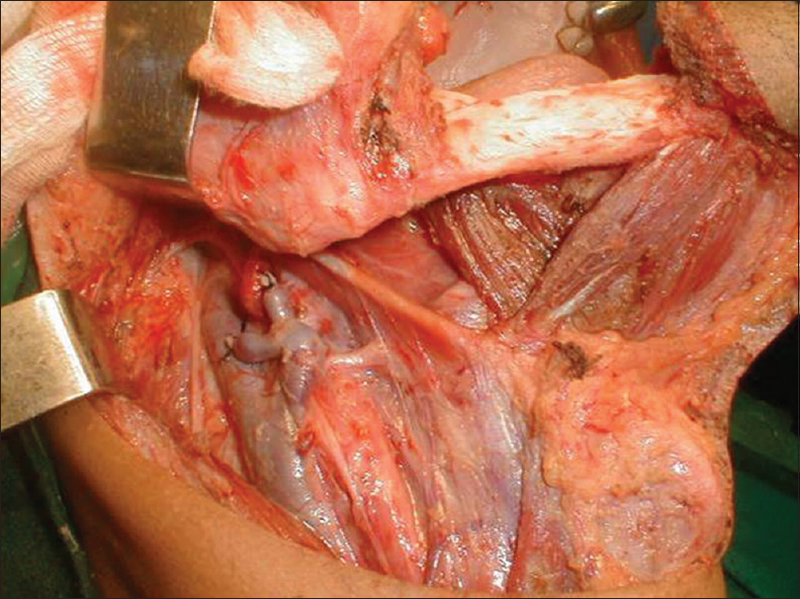 The changing role of pectoralis major flap in head and neck reconstruction. Eur Arch Otorhinolaryngol 2010;267:1759-63. Liu R, Gullane P, Brown D, Irish J. Pectoralis major myocutaneous pedicled flap in head and neck reconstruction: Retrospective review of indications and results in 244 consecutive cases at the toronto general hospital. J Otolaryngol 2001;30:34-40. Milenović A, Virag M, Uglesić V, Aljinović-Ratković N. The pectoralis major flap in head and neck reconstruction:First 500 patients. 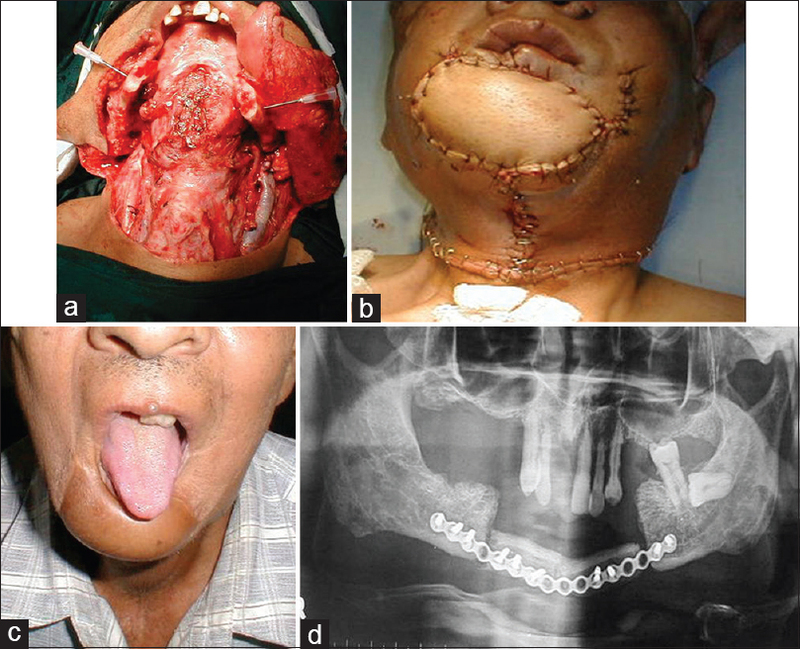 J Craniomaxillofac Surg 2006;34:340-3. Magge KT, Myers EN, Johnson JT. Radiation following surgery for oral cancer: Impact on local control. Laryngoscope 2003;113:933-5.
Cooper JS, Zhang Q, Pajak TF, Forastiere AA, Jacobs J, Saxman SB, et al. Long-term follow-up of the RTOG 9501/intergroup phase III trial: Postoperative concurrent radiation therapy and chemotherapy in high-risk squamous cell carcinoma of the head and neck. Int J Radiat Oncol Biol Phys 2012;84:1198-205. Sroussi HY, Epstein JB, Bensadoun RJ, Saunders DP, Lalla RV, Migliorati CA, et al. Common oral complications of head and neck cancer radiation therapy: Mucositis, infections, saliva change, fibrosis, sensory dysfunctions, dental caries, periodontal disease, and osteoradionecrosis. Cancer Med 2017;6:2918-31. Bots WTC, van den Bosch S, Zwijnenburg EM, Dijkema T, van den Broek GB, Weijs WLJ, et al. Reirradiation of head and neck cancer: Long-term disease control and toxicity. Head Neck 2017;39:1122-30. Jeong S, Yoo EJ, Kim JY, Han CW, Kim KJ, Kay CS, et al. Re-irradiation of unresectable recurrent head and neck cancer: Using helical tomotherapy as image-guided intensity-modulated radiotherapy. Radiat Oncol J 2013;31:206-15. Romesser PB, Cahlon O, Scher ED, Hug EB, Sine K, DeSelm C, et al. Proton beam reirradiation for recurrent head and neck cancer: Multi-institutional report on feasibility and early outcomes. Int J Radiat Oncol Biol Phys 2016;95:386-95. Licitra L, Grandi C, Guzzo M, Mariani L, Lo Vullo S, Valvo F, et al. Primary chemotherapy in resectable oral cavity squamous cell cancer: A randomized controlled trial. J Clin Oncol 2003;21:327-33. Blanchard P, Landais C, Petit C, Zhang Q, Gregoire V, Tobias J, et al. Meta-analysis of chemotherapy in head and neck cancer (MACH-NC): An update on 100 randomized trials and 19,248 patients, on behalf of MACH-NC group. Ann Oncol 2016;27 Suppl 6:950O. doi: 10.1093/annonc/mdw376.02. Kovács AF. Intra-arterial induction high-dose chemotherapy with cisplatin for oral and oropharyngeal cancer: Long-term results. Br J Cancer 2004;90:1323-8. Foote RL, Gilbert J, Gillison ML, Haddad RI, Hicks WL, Hitchcock YJ. 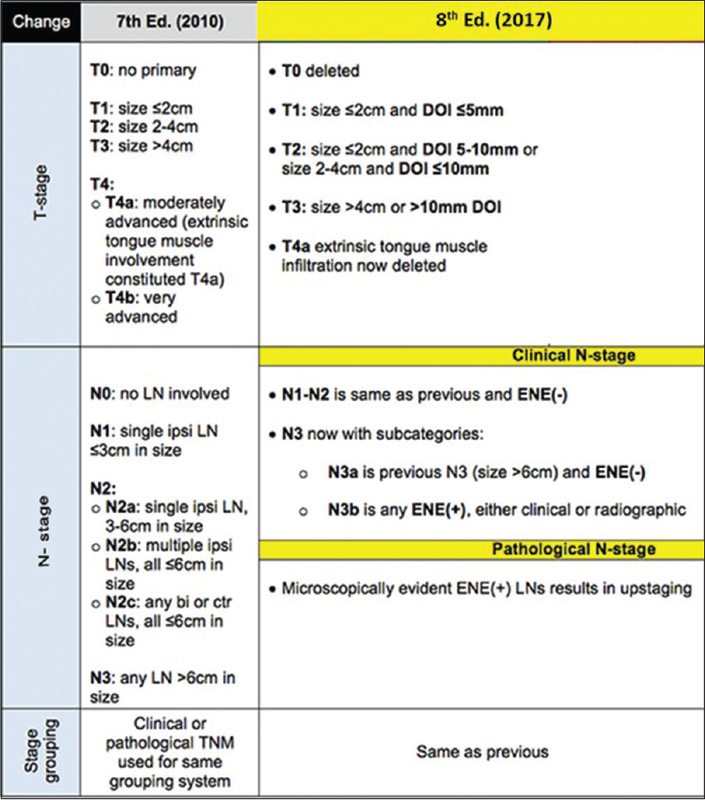 NCCN Guidelines Version 1. 2018 Panel Members Head and Neck Cancers; 2018. Available from: https://www.nccn.org/professionals/physician_gls/pdf/head-and-neck.pdf. [Last accessed on 2018 May 20]. Dewan AK, Dabas SK, Pradhan T, Mehta S, Dewan A, Sinha R, et al. Squamous cell carcinoma of the superior gingivobuccal sulcus: An 11-year institutional experience of 203 cases. Jpn J Clin Oncol 2014;44:807-11. Hamada GS, Bos AJ, Kasuga H, Hirayama T. Comparative epidemiology of oral cancer in brazil and india. Tokai J Exp Clin Med 1991;16:63-72. Patil VM, Prabhash K, Noronha V, Joshi A, Muddu V, Dhumal S, et al. Neoadjuvant chemotherapy followed by surgery in very locally advanced technically unresectable oral cavity cancers. Oral Oncol 2014;50:1000-4. Byers RM, Newman R, Russell N, Yue A. Results of treatment for squamous carcinoma of the lower gum. Cancer 1981;47:2236-8. Talmi YP. Quality of life issues in cancer of the oral cavity. J Laryngol Otol 2002;116:785-90. Simo R, Homer J, Clarke P, Mackenzie K, Paleri V, Pracy P, et al. Follow-up after treatment for head and neck cancer: United kingdom national multidisciplinary guidelines. J Laryngol Otol 2016;130:S208-11. Messadi DV, Sato K. Oral cancer chernoprevention: Current status and future direction. J Calif Dent Assoc 2016;44:101-11.